Unique cable pull arangement on this derailleur that pulls the cable sideways after it hits the cable stop. Details: The Shimano 600 AX groupset was the second line of shimano's Aerodynamic set of groups comprised if the Dura-Ace AX, 600 AX, and Adamas AX groups. Every part of the AX groups were designed to be as aerodynamic as possible, as evident by the brakes, seatposts and almost every other part in the group. 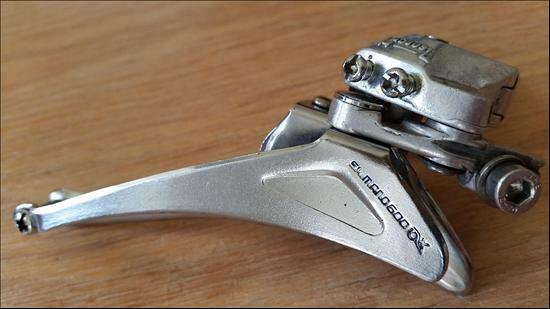 The AX groups also used shimano's 1" diameter axle Dyna-Drive pedal system.